Figure 1. 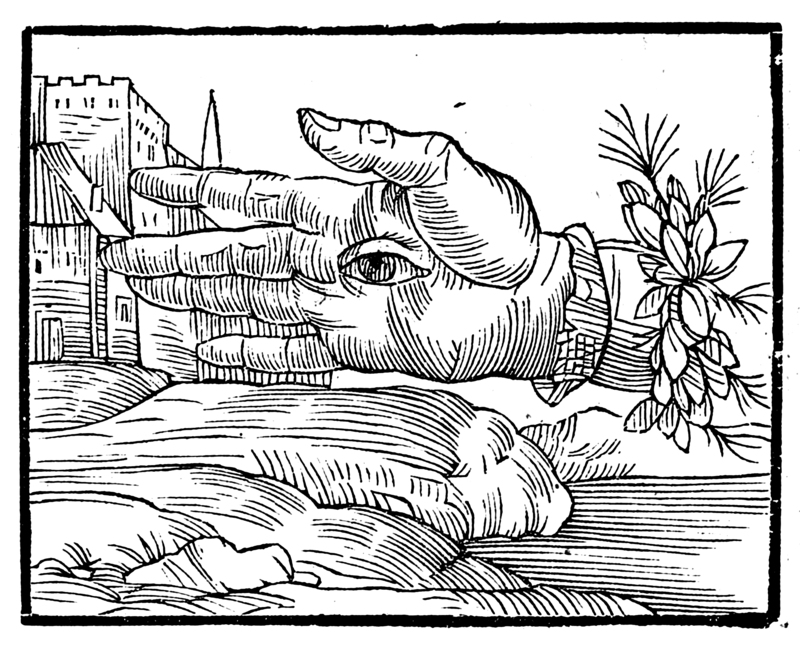 Andrea Alciato, “Emblem 16,” Emblematum libellus (Venice, 1546), 28. Used with permission of University of Glasgow Library, Special Collections. Young designers and beginning design students are often motivated more by emotion, immediacy, and sensuality than by ideologies, theories, or abstract principles. Causal relationships that are remote in perception, time, or space are less relevant than those that are immediate, present, and concurrent. Even when students understand the presence of these remote relationships, it is difficult for students to weigh them appropriately when compared with factors that may be much less significant but more present or immediate. In many architectural design programs this closeness is discounted. Instead, students are asked to begin with concepts and “big ideas,” gradually working towards greater and greater specificity. Unfortunately, many student projects remain largely in the realm of the speculative and untested drawing, remote from bodily experience, with materiality and matter either completely absent or only tentatively suggested in rendered images and scaled models. This approach does not adequately prepare students to address issues of constructability, emergent technologies, sustainability, and the complexities of integrated practice. In a hyper-mediated image-laden world, “materiality” has shifted from the matter and substance of buildings to a two-dimensional applique that can be interchangeably applied to three-dimensional models or renderings. Students without practical experience do not comprehend that the material properties, craft, and methods of assembly can greatly impact design decisions. As articulated by architect and educator Giuseppe Zambonini (1942-1990), “integration of the representational process in drawing with the experience of material itself is among the most difficult to communicate if one does not already believe that material—in its structural and aesthetic properties—precedes the transforming idea” (Zambonini 1988, 16). Many design students operate in a space where material reality exists as a remote horizon. This limits the ability of students to engage an important and expansive aspect of practice, and limits architectural possibilities. In order to close this distance, it is critical for beginning design students to work with matter directly to understand its physical characteristics (weight, dimensions, limitations) and its relationships to other materials (joints, intersections, adjacencies). This essay probes alternative approaches to design education that invert traditional approaches, engaging materiality, matter, and detail early to promote deep learning by beginning design students. Zambonini, Giuseppe. “Notes for a Theory of Making in a Time of Necessity.” Perspecta 24 (1988): 3-23.